When Table Top Racing (Free) hit the new release charts last week, we were pretty stoked not just by the pedigree surrounding the developers, but also its interesting graphical theme. Now that we’ve had some time to check it out, it’s obvious that Table Top’s environments and overall visual flair are pretty top notch. Unfortunately, a relatively generic gameplay outing and its emphasis on auto-acceleration controls keep the game from reaching loftier heights. The first thing you’ll notice with Table Top Racing is its unique visual style. 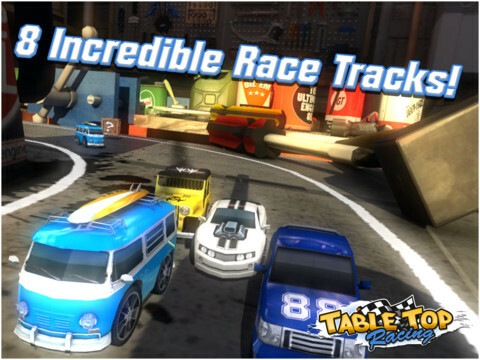 Taking a page from classics such as Micro Machines, Table Top has you racing across giant tables filled with every day items. For example, one theme has you on an Asian-themed restaurant table while another might put you in a Hawaiian luau setting. Not everything is food themed, as others simply place you in a kid’s room with wooden blocks setting up the racetrack. Maps are nicely done, inventive (at least for iOS) and look great. In addition to the fun theme, Table Top also excels in simply executing the basics. The graphics simply look great, with the behind-the-back camera angle doing a great job showcasing the visuals. The game even does a great job of making even the static backdrops come alive as you race around the level. Meanwhile, Table Top runs at an incredibly smooth frame rate, a must for frenetic racing games. Finally, I’m also a fan of the music, even if some of the tunes are heavily “inspired" takes on familiar songs. 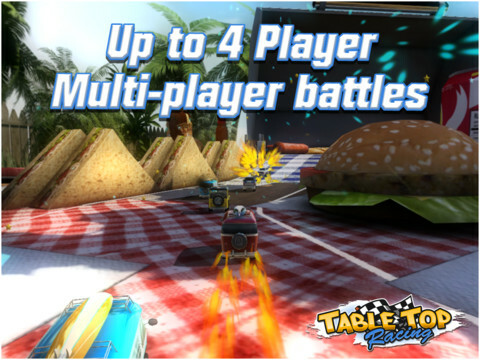 Otherwise, Table Top Racing is relatively straight-forward from a gameplay perspective. A robust campaign mode challenges racers to participate in a variety of cups that have players taking part in a variety of races that eventually lead to the proper cup. Race objectives range from standard fare (time trials and place matches) to objective (run into your opponent a set time has elapsed) to the dynamic (such as elimination matches). Hitting objectives or placing high enough earns coins that can be used to purchase and outfit your vehicles, which give you a better chance to succeed. Single race modes and multiplayer round out the selections. While there’s a lot to see and do in Table Top Racing, the game doesn’t really offer much in terms of innovation. Controls-wise, Table Top offers the choice of tilt-based controls or a simple left/right button scheme with both options using auto acceleration (and no brakes). Auto-acceleration seems to be the control scheme of choice these days for iOS racing titles and while I think the controls work decently, there’s still a certain amount of control lost that can be frustrating. It would have been nice to simply offer it as an alternative, even if it’s not the “preferred" way to play. Meanwhile, there’s a few facets of the game that don’t feel right. Players aren’t allowed to upgrade their vehicles in their own way; each vehicle has a set upgrade path and you’ll be spending coin on the next upgrade. If you don’t like the attribute it’s improving, all you can hope for is that the next stat in the queue is your choice. For that matter, the tuning in regards to earning coins, upgrades, and being able to advance in the campaign is a little too heavy on the coins, offering too much of an emphasis on IAPs. 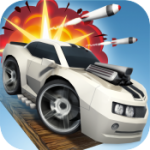 In the crowded iOS racing genre, there’s a growing collection of decent racing titles that either focus on killer visuals or innovative gameplay (with the best succeeding in both). Table Top Racing falls in the former category with a fun visual style that does a good job eliciting feelings of nostalgia. Whether that’s enough to differentiate itself from the pack is a matter of opinion, but as far as racing titles go you can do a lot worse.